“When my boyfriend proposes, I want it to be somewhere special, like Paris or on top of the Empire State building.” “I want my man to do something exciting and surprising when he proposes, like having a skydiver deliver the ring!” “I hope my partner hires Brad Pitt to propose on his behalf…” Okay, so maybe those ideas are a little far-fetched, but what woman doesn’t have an idea of how she wants the question to be popped? It may be as vague as ‘something romantic’ or it may be detailed right down to the music she wants playing, but most girls have some sort of scenario in the back of their minds. However, it is going to be a very big ask to have a guy meet those expectations if he doesn’t know what they are, and if she won’t help him. Most girls play these fantasies out in their minds but don’t let on that this is what they hope and dream of. It is a recipe for disappointment to want something but not communicate it to the one person who is supposed to provide it! The second most important element is making it possible. Once you have set aside fairytale ideas (sorry girls, I don’t think Brad Pitt does private gigs) you are left with some more or less realistic plans. The idea then is to make them as workable as possible. If you want to be whisked away somewhere romantic and exotic, make sure you have a current passport and a few free weekends. If you want to do something exciting, make sure you are up for scuba diving or bungy jumping! If you want to commit to a life together under the shadow of the Statue of Liberty, make yourself available for a trip to New York. If you are scared of heights or unwilling to fly or too busy to get away for a few days, it is unfair to expect your guy to go to great lengths to fulfill your fantasy because quite simply, he can’t. By imagining scenarios you make too hard to play out you are conspiring against him! Similarly, make sure he is able to cooperate. If he can’t swim, a snorkeling adventure will be out, and if he is on call an overnight getaway may be impossible just now. The proposal is just the start of the marriage journey, but if you want it to begin the right way, make sure you have let him know what that will look like and give him plenty of opportunities to get it right. 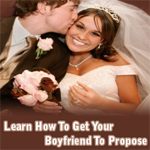 Learn the secrets to get your boyfriend to pop the question.